ALBUQUERQUE – The New Mexico Department of Game and Fish reminds New Mexicans that spring is the time of year when bears emerge from their dens and begin looking for food after their long slumber. Every year, black bears stray into neighborhoods, enticed by human food sources such as garbage and birdfeeders. Bears that associate humans with food can become aggressive and are a threat to public safety. “The department wants to give bears every opportunity to be wild, but to keep the public and bears safe, at times we have to step in,” Winslow said. “Sometimes we can educate the public about bear attractants, other times a bear has to be relocated, and occasionally, if a bear has become a threat to people, it has to be put down. Winslow released a male bear back into the wild in April 7 in the Manzano Mountains south of Albuquerque, after a department officer captured the young bear last year in downtown Bernalillo. The bear may have been looking for food in town, and was scared up a tree. The Wildlife Center in Espanola cared for the bear over the winter. If you really care about New Mexico’s black bears, help keep wildlife wild by remembering five bear aware tips. Keep trash away from bears. Only feed birds in the winter or bring bird feeders in at night. Keep food sources, including pet food, out of the reach and smell of bears. Keep barbecue grills clean or store inside. Pick fruit before it ripens. 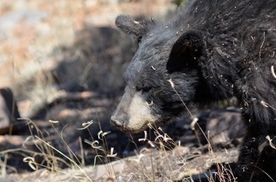 For more information about living with bears, visit the department website at www.wildlife.state.nm.us or follow the link to the Bear Aware brochure.